The Story Begins 1893- HORNS UP!! According to Wikipedia Texas Football has been "part" of the National Championship landscape 15 times. 4 times officially accepted by Texas and the NCAA (1963, 1969, 1970, 2005), 5 times recognized by the NCAA but not claimed by UT (1914, 1941, 1968, 1977, and 1981), and 6 times recognized as National Champion by some national rating services but not recognized by Texas or the NCAA ( 1918, 1930, 1945, 1947, 1950, and 2008). National Championship teams require good recruiting, a competent coaching staff, players with faith in the system, trust in and respect for teammates, combined with talent, team chemistry, a strong work ethic, and a little luck. The 1961, 1964, 1972, 2004, and 2009 teams were one lucky break away from a National Championship. A condensed bullet point history of Texas Longhorn football from 1893-1936 follows. Please go to the "credit" section of this website to view books you can purchase from many fine book stores about Texas Longhorn football or please visit the official University of Texas Longhorn site Texassports.com. In the 1900s, the term ” ‘VARSITY ” was derived from “UNIVERSITY.” In the state of Texas, students who attended ‘VARSITY went to THE UNIVERSITY OF TEXAS, and those who attend “college” went to a&m College . Texas went from 1893- 1932 with 40 consecutive winning seasons. 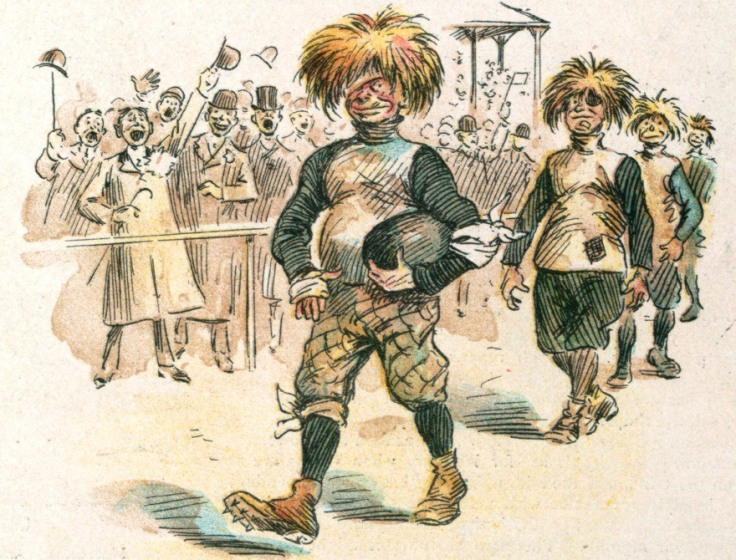 The SWC owes its existence to football popularity in the East and middle West in the late 1800’s . As Kern Tips says in his book Football Texas Style “ it came “unannounced, unsponsored, almost unnoticed, and in some quarters a little unwelcomed.” Rules of the game were formed but largely ignored. Teams were disorganized and brought bad humor to the game that resulted in many injuries, but the fans and players loved the sport. “These were the years of the more legendary figures ….-men who did improbable things in improbable and unorthodox ways. In 1894 the Texas A & M and Texas game begins. The “Bryan’s” ( A & M ) against the ‘Varsity” (Texas) at Clark Field Varsity won 38-0 . Texas was the first educational institution to add a semi-organizational format to a sport known for mass mayhem. Kern Tips says the early players were “grim and unsmiling” and their uniforms werd “lightly cladded” and unpadded in laced moleskins . Appreciation of team play was non-existent in this era. The one-man gang was the secret to success for fan support. Colors were gold and white. Jim Morrison (a tackle) makes the first touchdown. "The Varsity Team Wipes Up the Earth with the Tamale Eaters." The team moves from Hyde Park to Waller Creek. Texas first uniforms are orange and maroon but the Maroon is dropped because the word was associated with a body odor and the colors are changed to gold and white. Nov. 30, 1893 is the first official "Varsity" game against the Dallas football club who claim they are the best team in Texas. A field goal is worth 5 points , a touchdown is worth 4 points, and a point after attempt is worth 2 points. Halves are 15 minutes and the field is 110 yards long with no end zone. A new first down if the offensive team made 5 yards in 3 plays. There was tremendous banter between the two teams that is similar to the Texas-OU games to follow years later. Texas players lit up cigars and boasted of their great skills. A referee quit at 1/2 time during a bicycle race that with time would give way to bands because he was tired of being harrassed. Texas won 18-16 and the city of Dallas was stunned. During the early years of Longhorn football coaches were only given a one year contract. Team colors are changed to orange and white . I have never seen one image of Longhorn football player using a rubber nose mask to protect their nose and teeth, but there is an image in the LBJ Library that states this mask was used frome 1890's thru the 1920's. The team for 1894 is formed by Albert Lefevre who is the secretary-treasurer of the U.T. Athletic Council. Two lawyers (A.S. Walker and Thomas Gregory0 paid a $100 to purchase orange and white jackets, pants, striped stockings and several rubber nose guards. Arkansas does not beat Texas again until 1933. Arkansas travelled 6 days to play Texas in Austin. Arkansas loses 54-0 . Texas beats Arkansa every year from 1894-1933. In 1894 the Texas A & M and Texas tradition begins. The “Bryan’s” ( A & M ) play against the ‘Varsity” (Texas) at Clark Field . Varsity wins 38-0 . Missouri hands the Varsity its first defeat that was more a shellacking 28-0. Fans are angry and his handling of the Missouri game, and he quits. 1895 - 5-0 Record - Coach Frank Crawford was hired away from Nebraska but returned to Nebraska after the season was over. Longhorns join the Southern Intercollegiate Athletic Association and leave this organization in 1906. Texas plays their first Thanksgiving day game. The UT History Corner discuss's the uniform. "Recommended by Spalding’s Official Guide to Football, then the sport’s most trusted reference. Along with a long sleeved jersey, according to the Guide, “the ordinary player should wear a canvas jacket … home-made or purchased … and lace up in front so that it can be drawn quite closely.” Trousers were to made of some “stout material” and well-padded, “quilting in soft material over the knees and thighs.” Long woolen stockings were often covered with shin guards, and leather shoes – “kangaroo skin preferably” – which were provided with a replaceable leather spike to prevent slipping, completed the outfit. Naturally, Spalding’s sold the equipment for a nominal fee. A glaring omission from the uniform was something to shield the head. While a few players strapped nose guards over their faces, most went without any protection. Instead, they grew their hair longer, and at game time wrapped bandages around their heads and over the tops of ears (to prevent ears from being pulled and torn), which pushed the hair up into a mop. The mat of hair was supposed to be sufficient cushioning to prevent severe injuries." Coach Robinson was hired away from Missouri after his team beat Texas 28-0. After the season the Coach Patterson and Coach Robinson teamed-up to take the two teams on an exhibition tour of Mexico. An excursion that was suppose to last one week ended up lasted one month and both Universities and the players parents were upset that education took a back seat to sports. Coach Robinson wisely left after the season. First game ever for Varsity outside of Texas is against Tulane. Walter Schreiner HOH I believe he is the first Longhorn Hall of Honor inductee. Texas joins the Southern Intercollegiate Athletic Conference. Team plays several games against Missouri in Mexico . For the first years the football team is supervised by a athletic council that is affiliated with UT but not controlled by UT. That changes in 1897 after a faculty committee is formed which brings football under the supervision of UT. Coach Kelly becomes the “Physical Director for Men” with responsibilities to coach the football team. He lasted one year. 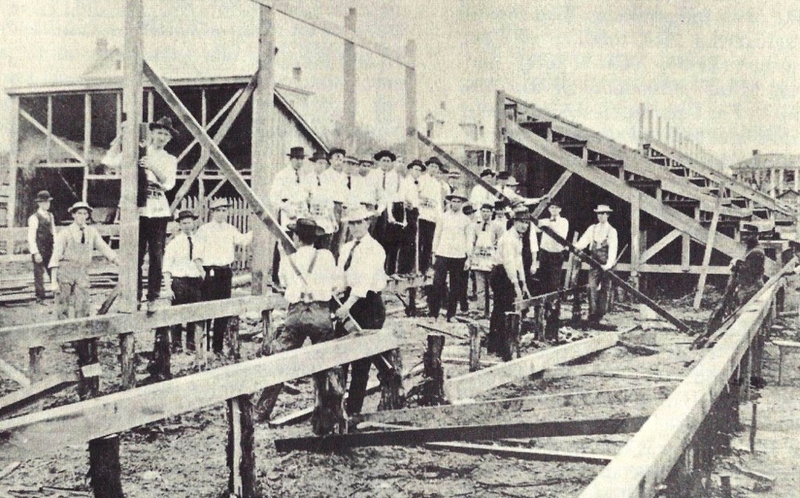 In 1897 Coach Kelly quit as Coach to be the director of the new Gym attached to the Main building . In 1898 he becomes the first assistant coach in the history of Longhorn sports. Colors were orange and maroon to save on cleaning cost. Jame Hart is an end on the 1897 football team, a tackle on 1898 team and a captain on the 1899 team. He leads UT to a 23-5 mark during his four seasons including a 6-0 record in 1900. 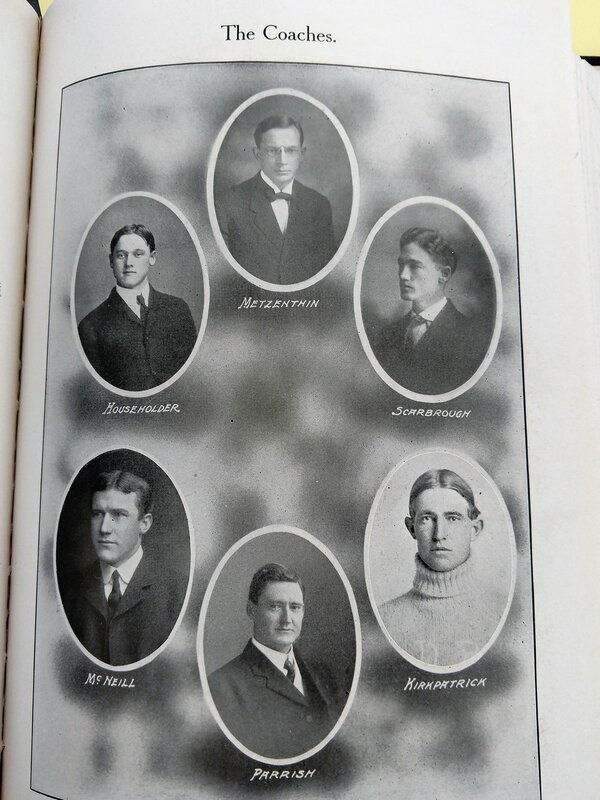 Hart also serves as secretary of the athletic association, and editor in chief of the 1899 Cactus. He returns as UT Coach in 1902 and leads the Longhorns to a 6-3-1 record. The image below comes from the fine folks at the Austin History Center. Coach Harts writes a poem in 1903 called the "Psalm of Foot-ball. Coach Kelly was retained as “physical Director” of the new school gymnasium. He is the first ever assistant coach in UT history. Coach Edwards was hired as head coach for one year and changed the colors to orange and maroon which upset the students and fans of Varsity. coaches evolve from professors who volunteer on a part time basis to help school team. This resulted in better teams and a new formula which place a value on victories. Texas plays AddRan from Waco a religious school that will eventually be known as TCU after moving to Fort Worth. AddRan has one player who tries to wear his gun on game against Texas. He is finally convinced to remove his gun , but after the game and losing to Texas 16-0 he wished he had obeyed his initial instincts. Played for Alonzo Stagg. Clark Field is purchased for $3000 for the University. Road trips to play town teams ended because of a fight the year before. Jim Hart kicks the first field goal in the history of Longhorn sports. First coach to have a two year contract to coach. The University tole Coach Thompson to play the American School of Osteopathy in Missouri . Coach told the University it was a mistake to play this school because their team was composed of pick-ups from all over the country. Texas lost 48-0. The colors are now "official" and the student body and administration vote for orange and white. The Longhorn band is organized but no women are allowed. the Texas-OU tradition begins. While Texas is a state, OU is still "Indian Territory". Texas wins first OU game 28-2 and according to The Die-hard Fan's guide to Longhorn football by Geoff Ketchum the Statesman newspaper called the meeting only a "practice game". ﻿ Coach Hart was 5’5” and 155 pound football player from the Ivy League. He wrote an interesting poem to motivate his team. "Eyes of Texas" is composed by John Lang Sinclair in a couple of hours. D.A. Frank a Daily Texan writer coins the phrase "The Longhorns." Longhorns travel to University of Chicago and lose 60-0. Football as a sport reaches a crossroads. Many individuals and the media were concerned with the violence and bone crushing direction of the sport. Many predicted the death of football by its on brutality. The sport was like watching to pit bull fight to the death. Nationally there are 18 deaths, and 159 serious injuries related to football. President Roosevelt states he will banish the game if "brutality, foul play, and inefficient officials" are not eliminated from the game. Changes in the style of football will change dramatically over the next 3 years. ﻿Schenker was hired because the famous Walter Camp gave him a good recommendation. Coach Schenker was a great guy, but he knew nothing about football so Lucian Parrish the best player on the team, Metzenthin a German professor future congressman, and the players coached themselves to a 9-1 record. Schenker was not invited back the next year. The UT administration hires Schenker as football coach and later discovers he does not know the rules of the the game or how to Coach football. Texas uses a forward pass to beat Texas A & M.
NCAA is formed to regulate college sports teams that choose "to win no matter what" . The goal is to open up the football game to stop in-fighting by the muscle men on the line of scrimmage and spread the participants out over a larger portion of the field. The introduction of the forward pass served that purpose. John Heisman thanks this new rule is a great idea. This one simple rule changed football forever. Author Kern Tips said this rule changed the the complexion of football n from brawn to brains, size to speed and agility, destruction to deception. Kern said the best part of the new rules is that they still allow for “ courage, tenacity, desire, dedication, and all other “spiritual” characteristics inherent “ in football . The pass play saved the game. Rules make It more difficult for lineman to carry the ball. The delineation between the role of a running back and lineman is established. Downfield coverage on punts is allowed. Forward pass is allowed, but if a pass does not touch a player on either side, the ball is turned over to the defense. WILLIAM ROBINSON WAS KiIled in WWI- HORNS UP!! Clark Field stadium is built in one week in preparation for the A& M game. Texas wins 11-6. James Clark was the University’s proctor, librarian, registrar, bursar, academic counselor, and groundskeeper. He was adored by the whole student body for his compassionate nature. In 1906, at the students’ asked Athletics Council to name the field after James Clark. The new rule that allows passing in a game writes the epitaph for the rugby style football that was great for the running game but awful for the passing game. The scientific name for this football shape was the “oblate spheroid. This ball was fat and aerodynamically unstable. Author Kern Tips says that in the early years of college football there was a good deal of latitude available in the shape of the ball. The home team could use a fat ball one week and a slim ball the next week. After passing was made a part of the football game, the rules committee streamlined the girth of the football from 23” to 21.5 “ but left the length and shape remained the same. 1909 "scrubs" were sort of like the Junior varsity. Notice their uniforms and who they played shown below. Coach Draper is a medical doctor who is hired as the Texas coach. His record was sub-par plus he lost to Texas A & M. After the season he resigned and became a doctor in pediatrics. Athletic play and recruiting’s bad reputation reflects poorly on the great universities but the Cactus think Texas is perfect. "Cactus" states " the college (Texas) had stood square for clean athletics. On the roster...., there are no stars from the East and South. There are no hired mercenaries.... Though defeat has been her (Texas) portion, no disgraceful professionalism stains the fair name of Texas. Squarely she (Texas) has stood for all that is honest and manly--all that she seeks to teach the youth of the South. Proudly she (Texas) may look forward to a victorious future. " 1909 the (T.I.A.A.) Texas Intercollegiate Athletic Association was formed. The SWC will follow 6 years later. It was the members of this association that first attempted to control athletic conduct and establish recruiting standards. Coach Wasmund is one of the first coaches not from the Ivy League. Michigan was the new cradle for college football prominence. Texas cancels the TCU game due to Wasmund’s death but before he passes away helps procure the services of Dave Allerdice for 1911. The track coach Burton Rix and the baseball coach Billy Disch act as the coaches for this year. Tied 6-6 with Texas, Baylor protest a call and exits the field as a protest. To this day , Baylor records still show that the football team in 1910 went undefeated. On the other hand Texas stated that by leaving the field Baylor forfeited the game and the Longhorns claim a victory and not a tie in their record book. Passes Have To Originate 5 Yards Behind The Line Of Scrimmage And Completions Have To Be Less Than 20 Yards. 7 Players Are Required To Be On The Line Of Scrimmage Which Is Needed To Get The Lineman Out Of The Backfield. Three Longhorns suffer broken bones in the UT-A&M game. A & M coached is accused of dirty play so Texas Chooses Not To Play Texas A & M Until A & M Releases Coach Moran. To replace A & M UT reaches out to OU for a possible series to replace A & M game. The letter from the Texas administration to the OU administration is below. Coach Allerdice is the first Texas Coach that remains for 5 years. Upto this point he is the most successful Coach of the Longhorns with a 33-7 record which includes one undefeated record and two 7 -1 seasons. Until Ricky Williams years at Texas Len Barrell held the record for most points scored in a season (121). He was also the First Longhorn To Gain More Than 100 Yards In A Game. Coach Allerdice Longhorns and Texas A & M meet in Houston to play a game. A & M is undefeated and unscored on and the Horns had only lost one game. Texas wins as Arnold Kirkpatrick picks up an Aggie fumble and returns for a touchdown. Author Kern Tips says the victory celebration by the Longhorn fans and angry Aggies after the game led to the first rupture of intercollegiate relations in the Southwest. The U.T. Athletic Association due to unnecessary A & M rough play suspends play with the Aggies. The suspension lasted until 1915 when the Southwest Athletic Conference was formed. Chairman Mather of the UT Athletic Council sent a letter to Professor Bagley of Texas A & M stating “ I beg to inform you that the Athletic Council of the University of Texas has decided not to enter into any athletic relationship with A & M College of Texas for the year 1912.” The breach lasted 3 years. Touchdown is changed from 5 to 6 points. The 1913 training camp was in San Marcos at Roger's resort on the San Marcos river. The work-outs and conditioning resulted in a undefeated season in 1914. Theo Bellmont is hired as the first Athletic Director. He is instrumental in building Memorial Stadium, starting the Texas Relays , scheduling the first "official" game with OU, creating the "T-association" , establishing the SWC, and reorganizing the Athletic council. Knute Rockne plays opposite Pete Edmond during the Notre Dame-Texas game in 1913. Knute says he has played against teams all over the USA, "but never did I go up against a better wing." "He was a terror when his team was completely overwhelmed." Knute Rockne is far right in black. Unfortunately, Clyde Littlefield the starting Longhorn quarterback is hurt and does not play against Notre Dame. Paul Simmons uses his somersault technique to evade tacklers. Paul Simmons is a gymnast turned running back who holds the ball with one hand and somersault's over the tackler. When this technique works it is breath taking and when his technique fails it is well.....breath taking. Wayne Wheat contributed this important part of Longhorn history. On this day in 1914, the Southwest Intercollegiate Athletic Conference, the future Southwest Conference, officially came into existence when the original eight member schools agreed on a constitution. The eight schools were Texas, Texas A&M, Baylor, Arkansas, Oklahoma, Oklahoma A&M (now Oklahoma State), Southwestern, and Rice, which was admitted provisionally. The new conference was the idea of L. Theo Bellmont, athletic director at Texas, and Dr. William Tyler Mather who successfully completed the project. Both men saw the need for the larger colleges of the area to organize to engage in intercollegiate athletics. Throughout its eighty-year history the Southwest Conference provided high-level competition in numerous sports for its member schools. In 1996, when the conference was broken up, the member schools were the University of Texas at Austin, Texas A&M, Texas Tech, Baylor, TCU, Rice, SMU, and the University of Houston. Oklahoma A & M withdrew from the SWC in 1916. In 1918 Southwestern was forced to withdraw due to the small student body population. In 1918 SMU joined the SWC , and in 1922 TCU joined. Billingsley Report- A football rating service- names Texas as National Champions. The NCAA also recognizes this team as National Champions. Six members of this team have been inducted into the Hall of Honor. Louis Jordan said about playing a football game " Nobody Leaves The Field Until We Beat The Hell Out Of Them." Fortunately for the opposing teams he practices anger management by participating and winning the conference in the hammer throw. Louis Jordan was Texas first All American and was killed in WWI. A & M is added back to the schedule when the A & M coach accused of dirty play is fired. There are 3434 student attending Texas. This team holds the record for Most points scored in a game (92). The Universities were tired of what they called the “Tramp athletes” choosing football over academics. University faculties were concerned that football players considered their sport as the final goal in life instead of a means to receive an education for life. Universities wanted to recapture their institutions destiny from muscular gents with a short term focus. Enter the formation of the SWC which over time managed to regain parental control of the petulant 21 year olds. The SWC opened the door to an era of responsible management of football for the betterment of athletes and the Universities. The use of a “ringer” to win a game was the first university winning technique abolished by the SWC. The ability of a University to sneak in a great athlete with no academic qualifications (ringer) was no longer tolerated. The SWC was determined to add minds and mores back into the football equation. Clyde Littlefield Holds The Record For inclusion on 7 touchdowns in a game. The SWC is formed to replace "town" play with college teams. Arkansas, Baylor, Oklohoma Sooners, Oklahoma State, Rice Owls, Southwestern Pirates, Texas Longhorns, and Texas A & M form the SWC to play "town" teams instead of "clubs". Southwestern Pirates leave SWC 2 years later. Coach Allerdice had a great career as Longhorn head coach with a record of 33-7. He is also credited for developing Clyde Littlefield and Gus Dittmar. No good deed goes unpunished. Coach Allerdice resigns because of the "super critical nature of the Texas fans." First Bevo did not like crowds or his title, and he only lasted until half. It would take 20 years before UT tried again to try using a Longhorn as a mascot again. Coach Juneau was the first Longhorn Coach that had to deal with recruiting athletes during a war. Most of the talented young men had joined the service. This was the first non-winning season in Longhorn history. Billy Disch was a factor in his hiring. There is nothing normal about football in Austin Texas in 1918. The influenza pandemic of 1918-1919 was one of the deadliest natural disasters in history, causing the death of 50 to 100 million people worldwide. Austin is not immune and the city faces many challenges. Football this year is not at the top of the list of priorities to attend. . The Austin death toll is significant and even takes the life of a starter on the Longhorn football team. At this writing I don’t know it is, but I will continue to search for the players name. Because of the war effort the 9-0 record was achieved by playing 5 college teams and 4 military squads. WWI is over and football grows in popularity. OU leaves the SWC and OU and Texas do not compete again until 1922. Phillip Haymakers join the SWC???? This was a decade of great growth in Texas football. Oil is discovered on UT lands in West Texas. Two strong willed administrators- Theo Bellmont and Lutcher Stark- lead the charge to make Texas Sports great. One of the great games in the history of Texas and A & M occurred this year. Both teams were undefeated and Texas had out scored opponents 275-10. A & M was unscored on for the year. A record 20,000 fans attended the game. Texas won the game 7-3 on a trick play as time was running out. Whitaker gets a raise from $3000 to $3750. Before becoming head coach at Texas in 1920, Berry Whitaker was hired by UT in 1916 as Instructor of Physical Training. His mission was to set up an intramural Sports program. This program would be 3rd such program in the nation following Ohio State and Michigan. In 2016 the intramural program celebrates it's centennial celebration. The intramural fields north of campus were named after him- The Whitaker Sports Complex . Whitaker is one of the most successfully coaches in the history of Longhorn football and he is inducted into the Hall of Honor. Universities finally understood that sports enhanced the brand of the university more than the classroom so there was a building boom for sports facilities. Largest crowd ever in the history of the state watch the Texas Longhorns and Texas A & M play football. Texas A&M was undefeated and unscored on in 1920 and Texas was also undefeated. The Longhorns won the game on a trick play in the last minutes of the game. Berry Whitaker’s team was SWC champs. Two strong willed administrators in Theo Bellmont and Lutcher Stark lead the charge. Longhorn Sports Leaders in the 20's- Berry Whitaker, Billy Disch, Theo Bellmont, Doc Stewart, and Clyde Littlefield. The A & M game is transmitted using a wireless account. It is the first game transmission in the SWC. This year formed the precursor for the January 1, Cotton Bowl . The Dixie Classic begins another precursor to the Cotton Bowl. The Aerial Circus begins. Passing dominates football until 1933. Many traditionalist thought that passing was a sissies way out of confrontation with unpadded men with fist clenched fist move mountains of men to make a whole for the running back. Abb Curtis was the defensive end on this team, and he also participated in the 23 game win streak in in basketball 1923. Abb in the 50’s was the assistant secretary of the SWC. A form of the hurry up offense with a unbalanced line is implemented by Coach Steward. Texas loses the SWC when a tie results in SMU winning the conference. Oscar Eckhardt’s bruising running style helps the Longhorns defeat the Aggies. • Texas Memorial Stadium dedication game: Texas 7, Texas A&M 0 (11/27/1924 - Thanksgiving Day) Texas won the game off a deflected pass for a touchdown that fell into the arms of Longhorn Stookie Allen and a legend was started that the Aggies could not defeat the Horns in Austin. For 32 years that was true. Excavation for Memorial stadium begins April 1924. The stadium will hold 27,000 fans. This was the last year for Shorthorn football. This team was comprised of ineligible athletes waiting on clarification of their eligibility status. This is the first year that a tie has a value. 1/2 of a win which would change the math on how to determine the winner of the conference. Texas - Baylor game is the first game in the SWC to be broadcast over the radio. Mike Ashburn broadcast the first SWC game between Texas and Texas A & M.
Buddy Sprague is an All American and also wins the SWC in the shot put. Allen on the Longhorn baseball team catches a deflected pass for a 52 yard touchdown to beat A & M.
Doc Stewart resigns this year, but he had a good career as the Longhorn football coach. His record was 24-9-3 and his teams beat A & M three out of the 4 years. Theo Bellmont and Doc. Steward are fired. A link from the Stark Center about Clyde Littlefield is below. According to Kern Tips, offenses continued to force defenses to innovate. Offense Spreads, spins, reverses, and the use of the play - pass forced defenses to probe, hit-and-run, read the blocks, react and pursue, gang-tackle and to red dog- to wreck the play at inception. From 1928- 1930 Clyde Littlefield's Teams Have 14 Shutouts In 16 Games. UT's 10 Shutouts In A Row Remains The Longest Consecutive Shutout Streak In UT History. He is the most prolific athlete in Texas Sports history. In four years he earned 12 letters in football, basketball, and track. In 1914 he was the leading scorer in football and basketball. In track he only lost 1 race in four years and tied the world record in the 120- yard hurdles. After dealing with orange and white jerseys fading to yellow for many years after washing, Littlefield changes the colors to burnt orange. It appears that Coach got tired of the competitors calling Texas "yellow bellies". Burnt Orange is used until WWII causes shortages in the dyes needed to make "burnt orange." Bellmont is demoted from Athletic Director to Chairman of the physical education department. Dexter Shelley was the working horse in the back field. Dexter was a triple threat- punt, pass, and run. The link below will take you to the The UT History Corner and the first captured audio of the Eyes of Texas and Texas Fight. Please peruse this site for more historical information to UT. Dixie classic the precursor to the Cotton Bowl begins. The Texas State Fair donates a trophy to the Texas-OU game: the Golden Hat. Coach Littlefield has won the SWC 2 out of 3 years , but he lost to lowly Rice University and the fans were angry. How could Texas lose to a 6th place team? Texas had 6 all conference selections. Not acknowledged by the NCAA or Texas but recognized as a national champion by some national rating services. Clyde Littlefield's best team is the 1930 SWC champs with Ernie Koy a great baseball player, Bull Elkins who is a three sport star and the only UT football player ever offered a Rhode Scholarship, and Harrison Stafford who is is also a member of the track team are the leaders of the team. Harrison Stafford at the conference championship is part of the winning relay, places 3rd in the broad jump, and 4th in the javelin and 3rd in the low hurdles. Dana Bible said Ernie Koy was the greatest fullback every seen in action. In 1933 served as an assistant football coach for Texas before being signed by the New York Yankees. In the 45th year of Texas football UT is searching for its 21st coach. Bohn Hilliard Holds The Record For Longest Punt Return (95 Yards). Koy and Stafford were a powerful one two punch for the Longhorns. John Henderson is 4th from right on bottom row. As of September 2016 he is 103 years old in good health and very active. He is the oldest living Texas athlete of all time. There is an attempt by the faculty to have a post season game to raise money during the depression. SWC officials ban broadcasting of games. They fear that people will not attend the games if they can listen to the game on the radio. 40th anniversary of Texas football and it is the Longhorns first losing season in Texas football history. Luther Stark wants Littlefield fired, but Littlefield wants to remain track coach so resigns from coaching football and continues to coach track for 41 seasons and wins 25 league championships. An important year for SWC football. Rice beats powerhouse Purdue and Texas is a victor over Notre Dame. The SWC had finally won some respect. 20 years after the formation of the SWC, all the teams played each other for the championship. Exactly how the big 12 plays now vs the SEC who had two divisions and not all teams play each other. This was the year that demand for game tickets exceeded seat capacity of the stadiums. So a side bar broadcast system was created and controlled by the conference to make sure that those who could not get a ticket could listen to the game. Jack Chevigny who played for Notre Dame and scored the winning touchdown after Knute Rockne's "win one for the Gipper" speech is the Texas new Head Coach. As of 2013 Chevigny is the only head coach at Texas with a losing record. The first Orange White scrimmage is played before 4000 fans on Round Up Week-end. Texas beats Notre Dame 7-6. The game is considered one of the biggest upsets of all time in college football and After game the Coach gets a new car. Bohn Hillard is also a great baseball player. All SWC in baseball. He bats .356 and is 3-2 as a pitcher. 1935 is the year that the “golden” boys of football arrived. It took the Longhorn teams awhile to participate in this new form of hero worship. I don’t know if the following story is true but it is articulated by author and former Longhorn football player R.E. Peppy Blount in his book titled Mamas, don’t let your babies grow to play Football about a “early 1930’s team that made an “unknown wager by Texas players” on the Texas-OU game “that would ultimately be the stimulus to provide the winner’s edge for the Longhorns”. Peppy states that the final score was 13-6. There is no 13-6 Texas-OU game in the 30’s , but there is a 12 -7 game in 1935 that Texas won. It is possible but improbable Peppy changed the score and mentioned no names in his story to protect the reputation of the players. Regardless, the story is told as follows. Peppy states that the student managers job at the Texas-OU game was to sell all the Longhorn players tickets in Dallas prior to the game. The managers did as instructed but instead of giving the players their money chose to gamble all the proceeds on Texas winning the game without telling the Longhorn players of their action. At half time Texas was down by one touchdown and the managers were so stressed that they confessed what they did to one of the co-captains. Right before the team was to leave the locker room the captain asked the coaches to leave so the team could have a private meeting. The captain told the team the circumstances and Blount says “ the first inclination on the part of the team , was to kill the student managers . Just as quickly , however, it was decided they had better get out there and play not only to win but to preserve their fortunes”. Texas won. 1936 the Associated press came out with the first football poll. Jack Collins holds the record for most return yards in a game (95). Chevigny chose to recruit outside of Texas which offended the Texas high school Coaches. He starts using films to study games. Texas has it's first 'training table" and athletic dorm with a "dorm mother" by the name of "Ma Griffith". Coach starts tradition of the players staying together before a game. -not in a hotel- but on a Pullman Coach car. his decision in 1936 to pull his starters when Texas was beating Baylor 18-0. Texas lost 21-18. CHEVIGNY IS KILLED ON IWO JIMA IN WWII. HORNS UP! Another legend surrounding Chevigny is that, after the 1934 football victory, he had been presented a fountain pen with the inscription, "To Jack Chevigny, a Notre Dame boy who beat Notre Dame", and that on September 2, 1945, this pen was discovered in the hands of one of the Japanese officer envoys at the surrender of Japan on the battleship USS Missouri. The pen was sent back home, and the inscription was changed to read, "To Jack Chevigny, a Notre Dame boy who gave his life for his country in the spirit of old Notre Dame". The legend, which surfaced in 1945 in conjunction with the anniversary of the November 10, 1928 football game, has been a part of Notre Dame lore ever since. However, no one in the Chevigny family has seen or confirmed the existence of the pen, or that the inscription was changed.